Are you looking for weekend volunteer opportunities through the school-year? Stepping Stones’ Saturday Club and Weekend Respite programs would love your help engaging children, teens and adults with disabilities in a variety of recreation activities. Volunteers are welcome at our popular Saturday Clubs at the Given Campus (Indian Hill) and Weekend Respites at the Allyn Campus (Batavia). Meet service hour requirements while enjoying a memorable experience and helping children, teens and adults with disabilities. Volunteers must be at least 13 years old, have a desire to help people with disabilities and be able to display appropriate and responsible behavior. Browse Saturday volunteer opportunities below and apply online by clicking the “Volunteer Now” button in the sidebar. In January 2019, Stepping Stones launched a new software to give volunteers direct access to registering for shifts, managing their schedule and tracking service hours through an online profile. 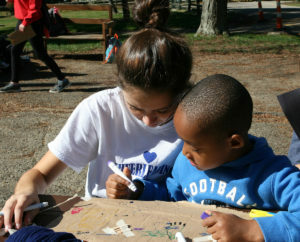 Assist children and young teens with art projects, outdoor activities, sports, music, holiday parties and more. Time: 9:15 am to 3:00 pm. Dates: Click here for a list of dates. Volunteer in this fun, social program to help teens and young adults prepare appetizers in the kitchen, complete art projects, dance at holiday parties and more. Time: 3:45 pm – 9:00 pm. Volunteer with teens and adults in a beautiful, natural setting. Help participants with sports, art projects, skill-building activities like cooking and archery, evening talent shows, dances and more! In January 2019, Stepping Stones launched a new online volunteer application and software! Complete our new application by clicking the "Volunteer Now" button below. Returning volunteers will need to submit a 2019 application to receive a username and password. After completing the application you may register for upcoming shifts, manage your schedule and track service hours through your personal profile. If you have questions on our new volunteer software or upcoming opportunities at Stepping Stones, contact the volunteer office by email. In the event of an absence, please email us.